Combine the cream cheese, butter, confectioners sugar and vanilla extract in the bowl of a stand mixer. Beat on low speed for 30 seconds, then increase speed to medium and beat for 2-3 minutes until light and fluffy. Use the frosting to frost a two-layer cake, 24 cupcakes or a sheet cake. I don't bake cakes often enough. Really, I don't. It's so easy to bake a cake with homemade frosting, especially if you are like me and use a box mix for the cake. I love to make my own homemade frosting, though, which is surprisingly quick and easy! Controlling the level of sweetness is a huge boon. Plus, it's so easy to customize homemade frostings -- add some color or flavor (lemon zest, anyone?) and so on. When fall rolls around, I love making delicious cupcakes in carrot and pumpkin flavors, and what goes better with those than some perfectly decadent cream cheese frosting? 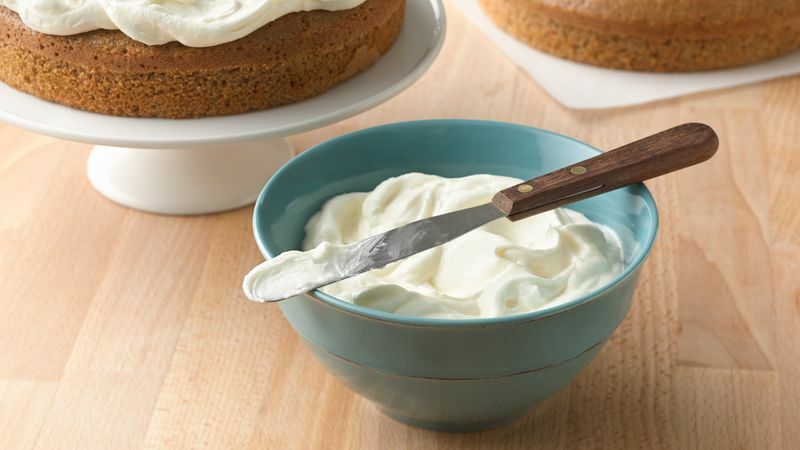 This Cream Cheese Frosting is tangy and sweet. It spreads on easily and melts in your mouth. Just whip together the cream cheese, butter, sugar and vanilla and you're good to go. To frost a cake the right way, first spread a thin layer of frosting all over the cake -- ignoring any crumbs that surface during this initial pass. Ever wonder why bakery cakes always look so perfect? Now you know. This is what bakers call a 'crumb coat', which locks in the crumbs. Once you have done that, rinse off your spatula, so it's crumb-free. Apply the second layer of frosting to the top first and then the sides. To get a smooth finish, rinse your spatula a final time -- this time in very hot water. Dry it with a paper towel, and quickly use the hot spatula to smooth all the areas to give it that bakery-like professional look. Want to do a little decorating? Spoon leftover frosting into a pastry bag, with the desired tip, and pipe it on. Or, if you want an easy pro trick, use purchased chocolate curls and pile them on top – voila! We found these by the decorator sprinkles in the baking aisle at the grocery store. Now all that's left to do is grab some friends to come and taste your beautiful creation!